New York Fashion Week is creeping toward us like a judgmental grandmother and the designers are out and about sharing opinions you'd probably rather not hear, like 'Hey, you look awful!' 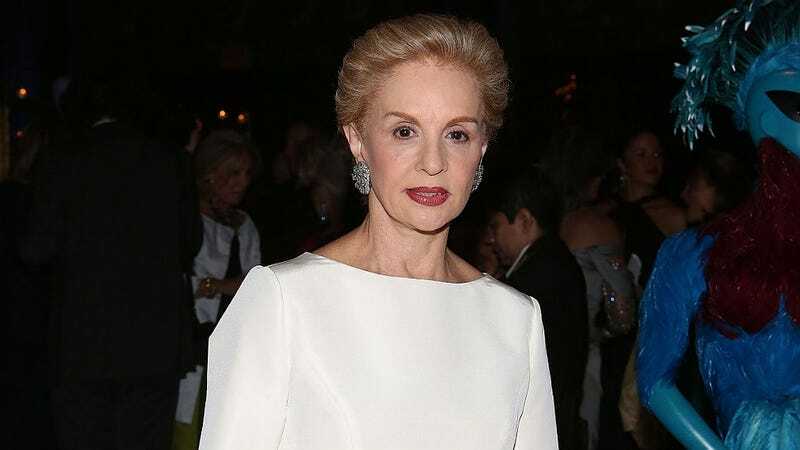 Enter Spanish fashion house head Carolina Herrera and her Thoughts On Your Ensemble. According to the Haute Living, Herrera descended upon New York for her show next Monday and recoiled in horror at the street style she was forced to endure during her black car ride to her appointments. "If you look at the people walking around the streets of New York at this moment, it is horrendous!" she exclaims. "I have never seen people so badly dressed in my life! It's amazing the way they look! I don't know why… I don't know what's going on… but it's really, really bad." The main offender: crop tops. "When you are very young and you have a wonderful figure you can pull it off, but whenever I see this style, it's usually on the wrong person. I was sitting in traffic this morning looking at the people on the street, and I thought to myself, 'What is going on here?!' Everybody is wearing the wrong clothes. Proportion is very important. Wear clothes that are flattering to your figure and appropriate for your personality." It's so hard suffering through poor sartorial choices, right? Why can't everyone dress like First Lady Michelle Obama or Jackie O, is what Herrera wants to know! Well Herrera, your average New Yorker probably doesn't have Onassis or MObama's clothing budget or, you know, designers like yourself sending them swag for free so ... all of this terribleness will probably continue. At least until the weather cools off.